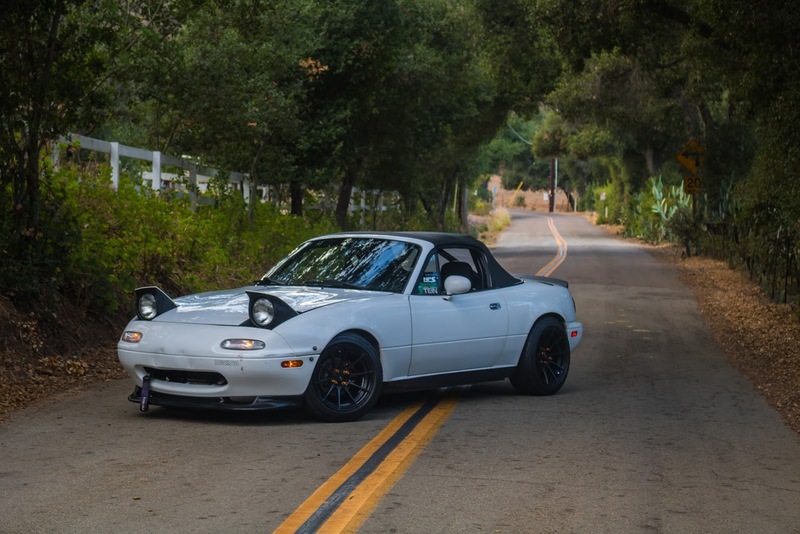 There are stanced Miata's, and there are boosted Miata's, but then there is Tim's stanced and boosted Miata. The goal of the build was to find a nice medium of power and style while keeping a budget in mind. This is Tim's 1991 Mazda Miata. It was purchased for $2,600 with 120,000 miles and nearly no modifications done. This little car was in for a lot of change. Here's the state of the car when it was first purchased. It had some decent wheels and a roll bar, but it was not aesthetically pleasing and was so slow it would lose a race to drying paint. With the help of friends for motivation and the help of the people at throtl, this car was able to make a lot of change within a few months. After about a month of ownership, the car received some coilovers and some other exterior mods like a front lip and rear duck tail. This was the beginning of a modification frenzy that would spark major change in the vehicle. After driving the car around for awhile, Tim made the realization that the car was due for some maintenance and some more modifications. Long story short, Tim decided to do a timing belt job but ended up tearing the whole engine apart. A plan for a complete mechanical restoration was set in place. While the car was on jack stands, the decision was made to buy some wheels, and a turbo kit which would really change the look and feel of the car. At this point the car was just a huge never-ending money hole. With the help of the throtl app, Tim was able to find a combination of new and used parts for his project at the lowest prices available. Ebay front lip, ducktail, and side skirts.